How many of you have heard of or read about the “United States Courts Ransomware MoneyPak Virus”? It puts a pop-up on your Desktop that totally freezes your machine. I mean you can’t do anything. Your computer is permanently stuck until you manage to get rid of this thing. This crapware purports to be from the US Government telling you that you have done something you need to pay a fine for. It tells you to go to Wal-mart or 7-Eleven and use MoneyPak to send money to a particular account and in return they will send you a key that will unfreeze your computer. Sure they will. 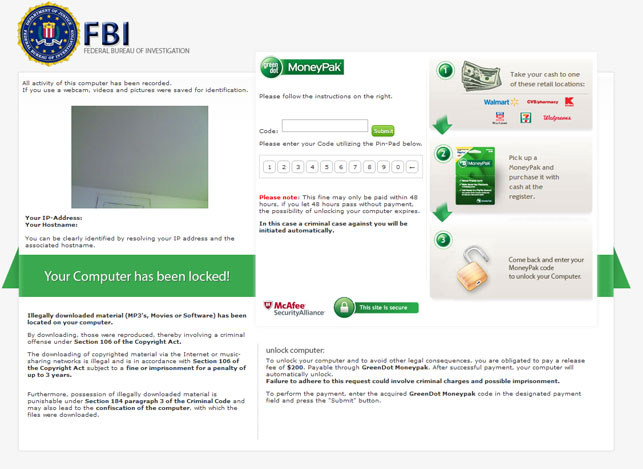 I just spent an entire afternoon cleaning “FBI MoneyPak Virus” off of a friend’s laptop. I dealt with Moneypak virus once before about a year ago (it’s actually a trojan) and I easily destroyed it using Hijack This software on a thumb drive. This time was different though. This new version of the Moneypak Virus is apparently capable of deflecting a BIOS directive to boot from any drive other than the hard drive so even when I tried to boot my friend’s PC with the thumb drive I still was presented with the MoneyPak image displayed on the Desktop with no way to close it in order to access anything at all on the computer. If you Google “FBI MoneyPak Virus” you’ll find dozens of pages claiming that Hitman Pro on a thumb drive is the way to deal with this thing and I tried that but System Restore from the Command Prompt was the only way I could find to beat it.